Yesterday I told you all about how I set up for our black light themed play date. If you missed that post, you can read all about it here. 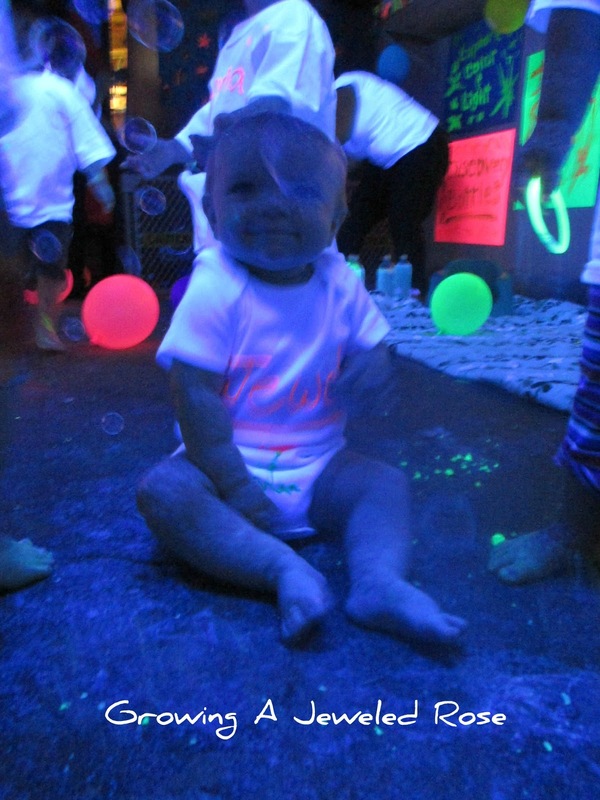 In today's post I am sharing the fun and messy memories that were created during the black light party. 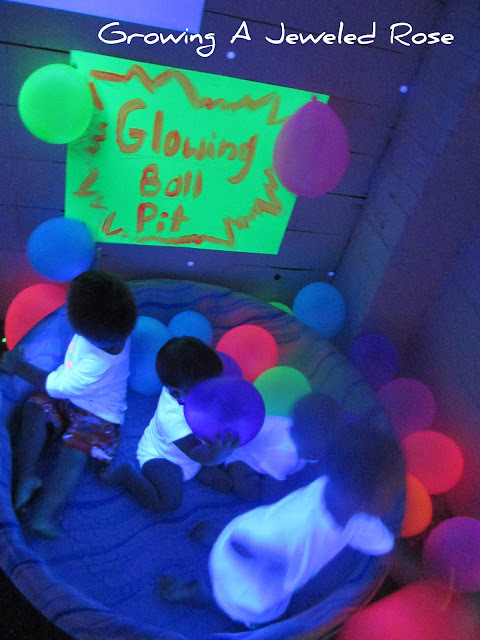 All the little ones had a blast playing in the glowing pit throughout the play date! 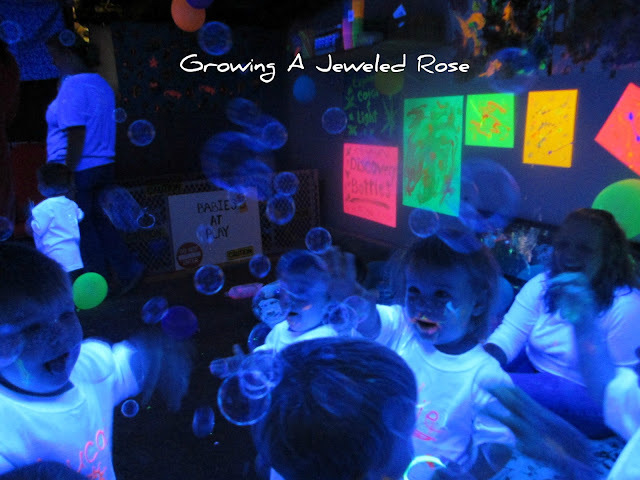 The Glowing Face Painting Station was definitely everyone's favorite! 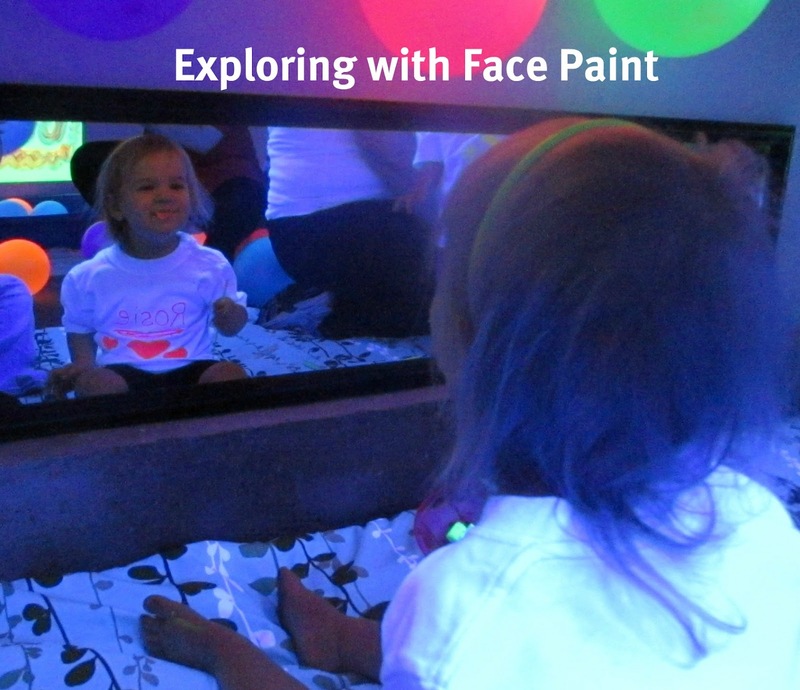 The children loved being able to see themselves paint their own faces! 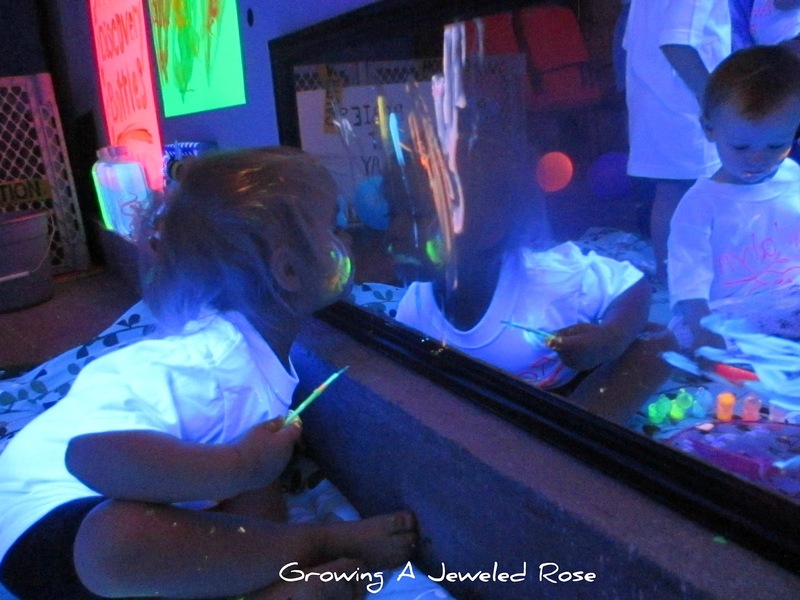 They also had fun painting each others faces! 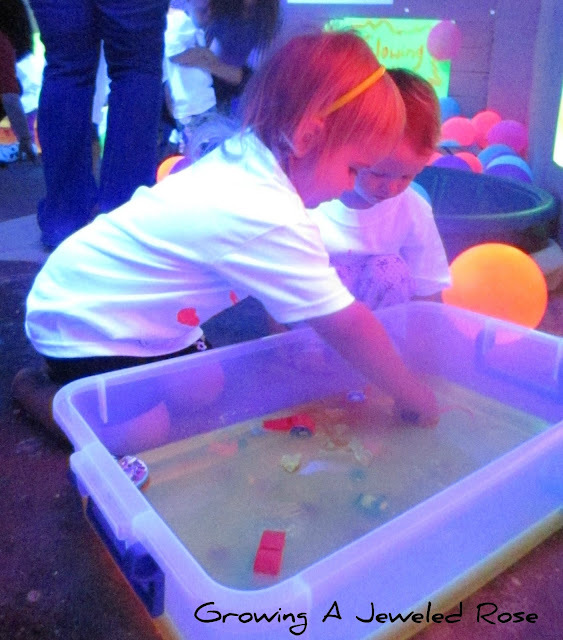 The toddlers definitely dug into the Glowing Jello Dig more than they had the previous jello dig. 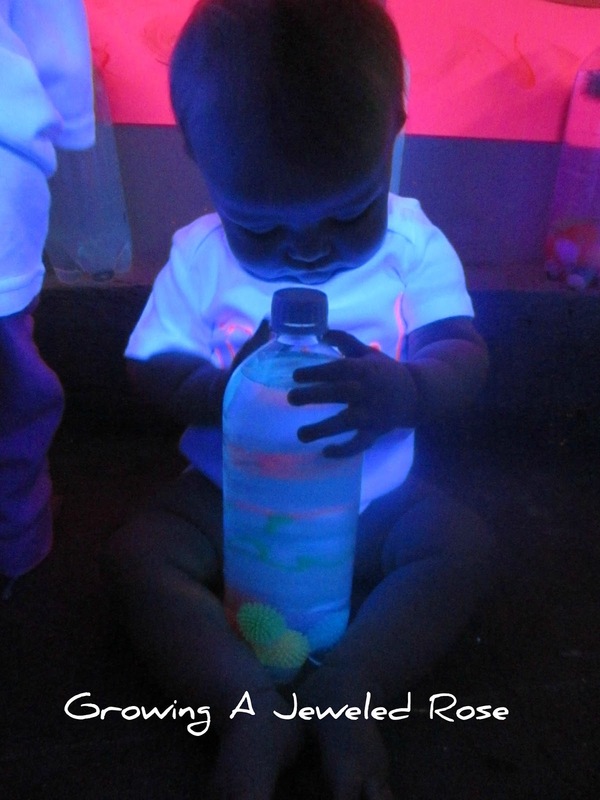 The Glowing Discovery Bottles were a fun and safe activity for the babies in the group! All the children were in awe over the Glowing Water Beads and had a lot of fun swooshing them around with their hands. 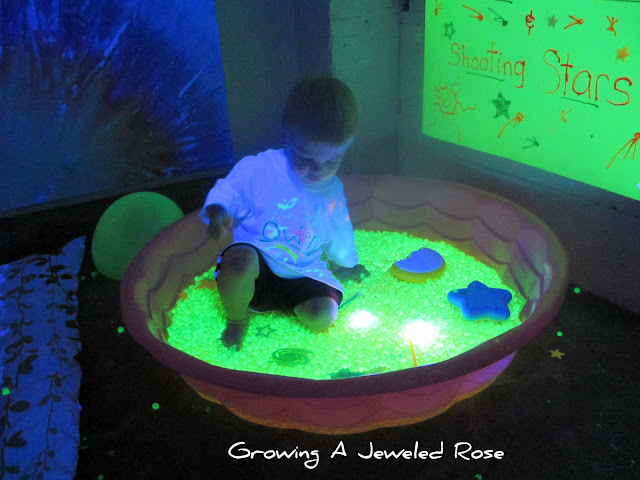 I had mixed a couple submersible LED lights in with the water beads, and all the little ones thought these were so neat! I actually can't wait to repurpose them and toss them in the bath with Rosie and Jewel! 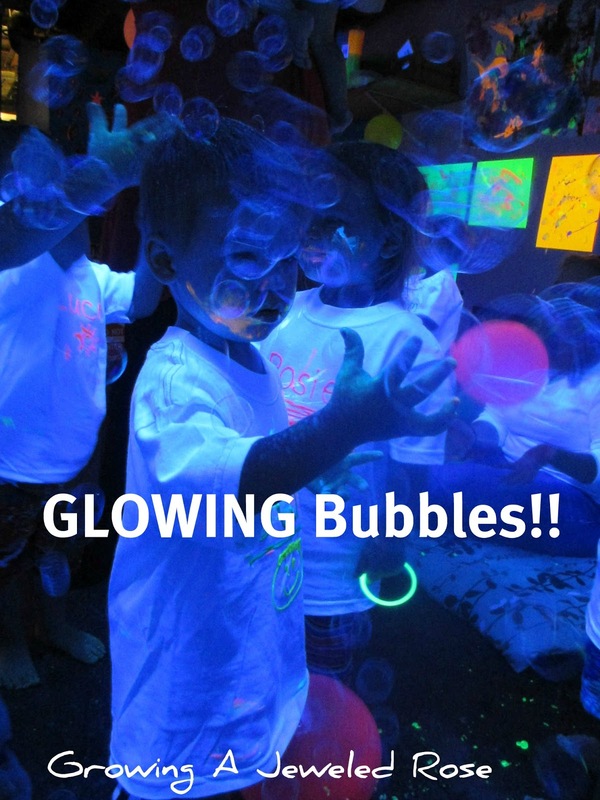 One way to make children love bubbles even more... make them GLOW! 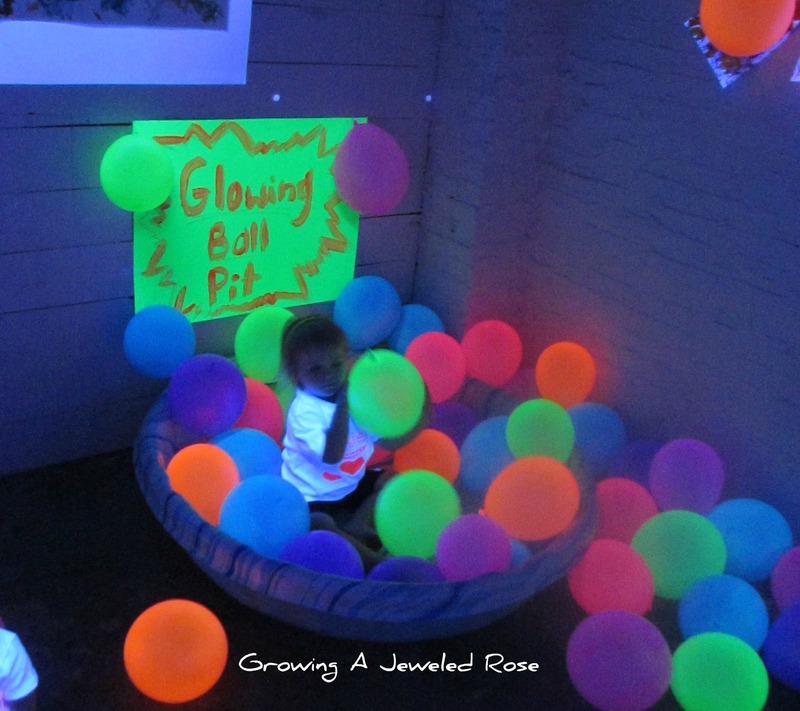 The children loved chasing and catching them. 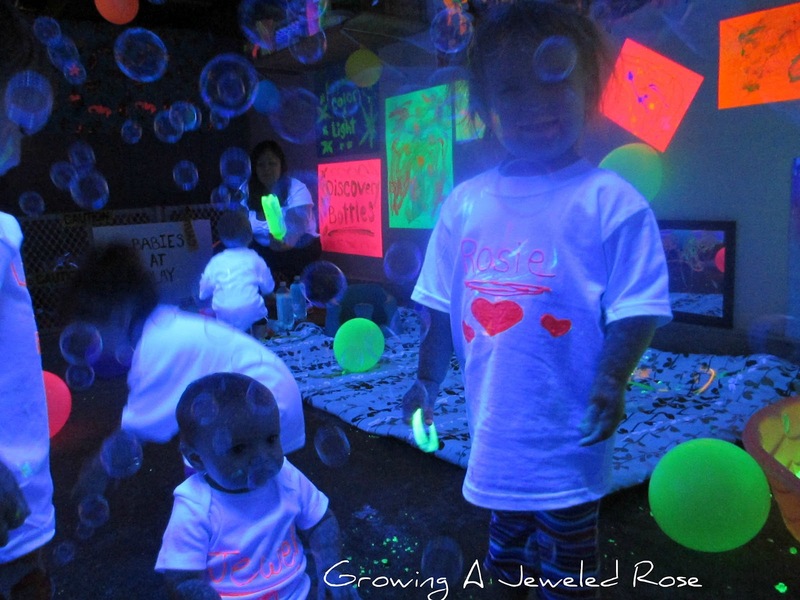 The Glowing Bubbles were great for the babies and the toddlers. 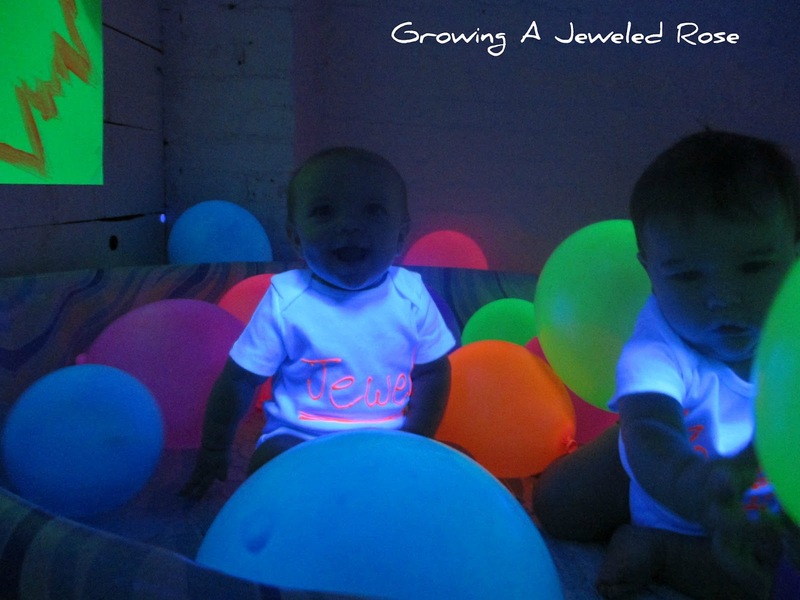 Jewel loved them! 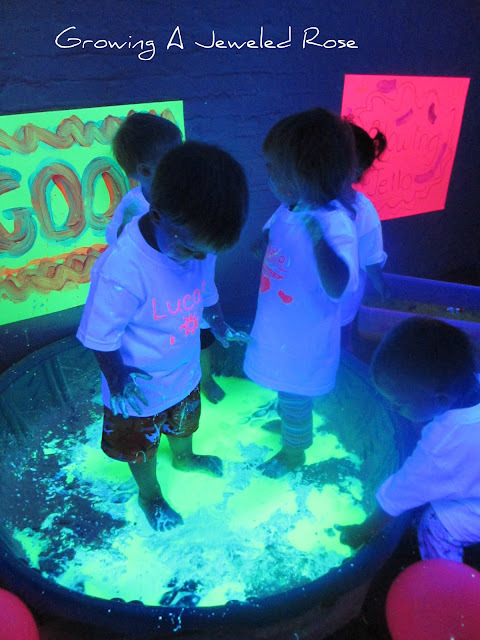 We saved the Glowing GOOP for all the little ones to enjoy together at the end of the play date. 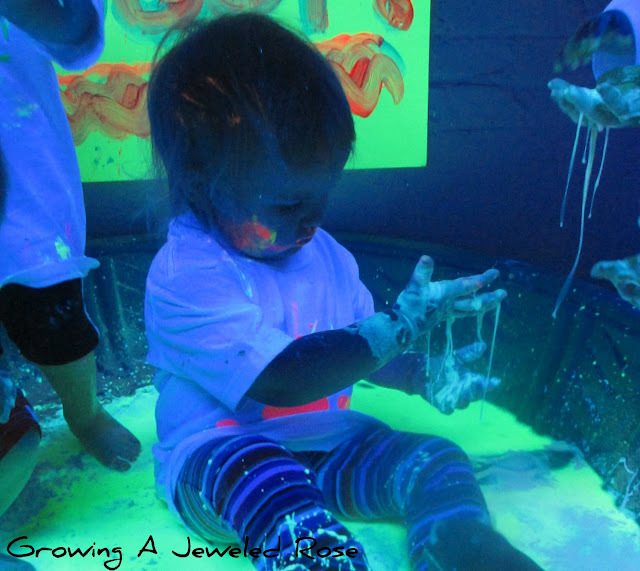 Making the Glowing Goop was an incredible sensory experience in itself. 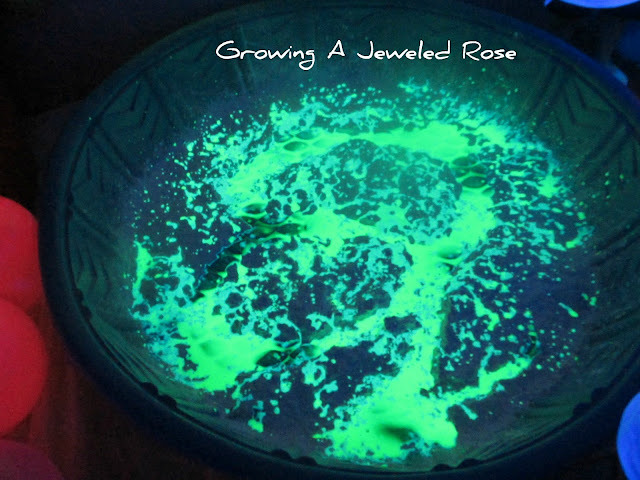 It was quite a sight and looked a lot like lava while being mixed! The little ones were anxious to get in, so I continued to mix the goop as they piled in. 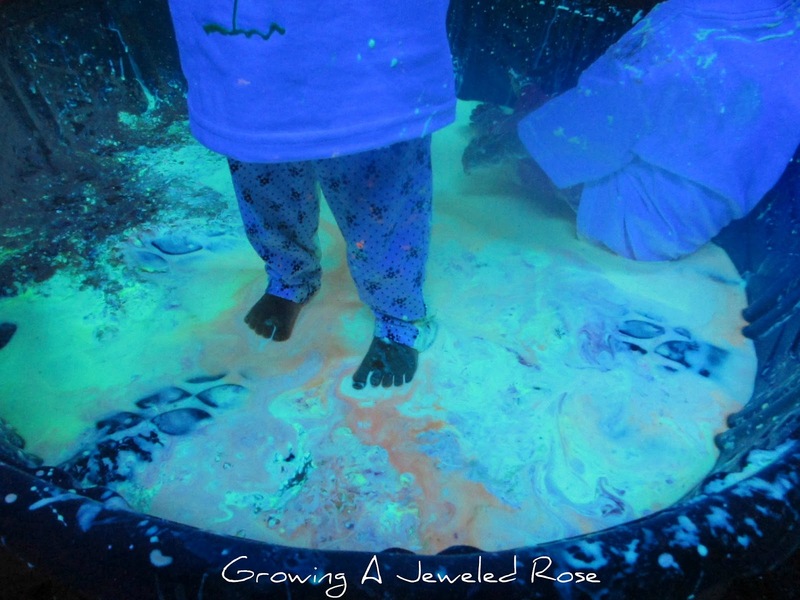 They ended up helping mix it by stamping around with their feet. GOOP really is so neat! It acts a lot like quick sand. If you walk quickly across the surface, you can walk on it. However, if you step into it, you will sink, and get stuck. 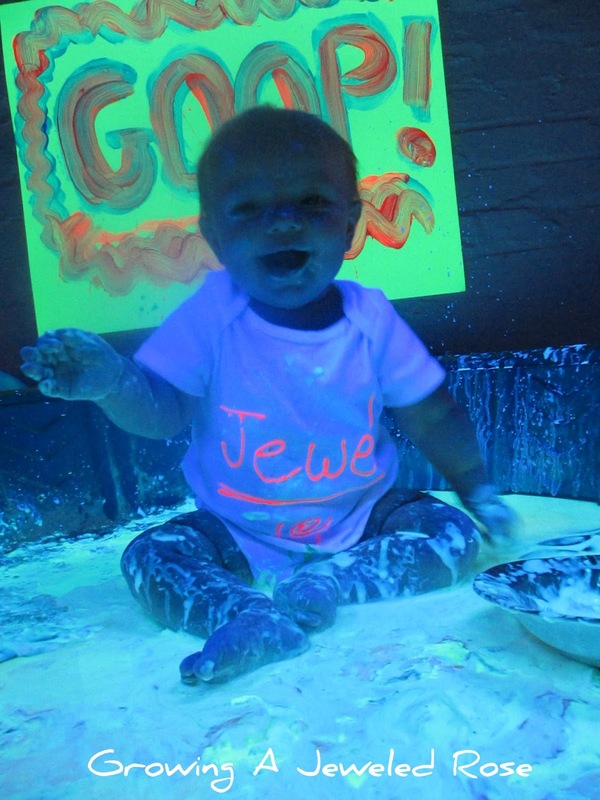 Even baby Jewel really LOVED it!! 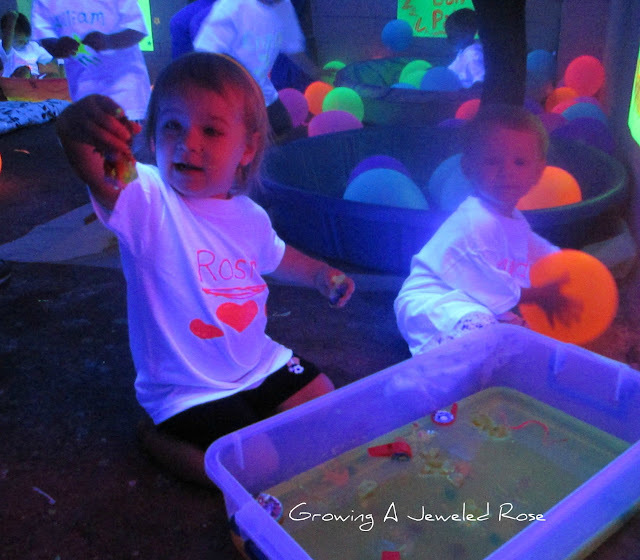 This play date was so much fun! 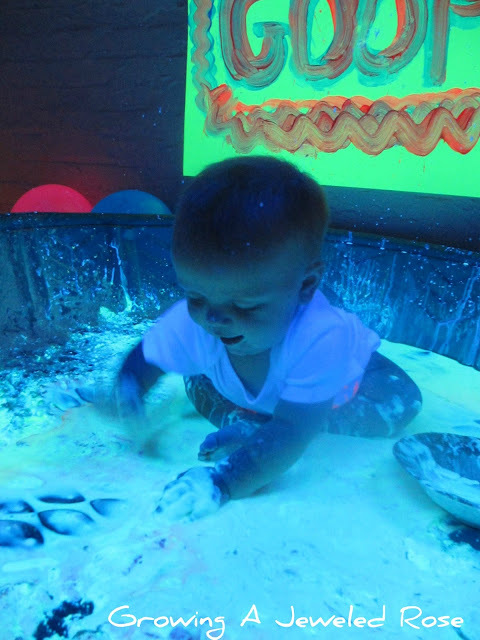 Now that we have invested in the black lighting for the basement, I am looking forward to continuing to discover new ways to explore with black light. 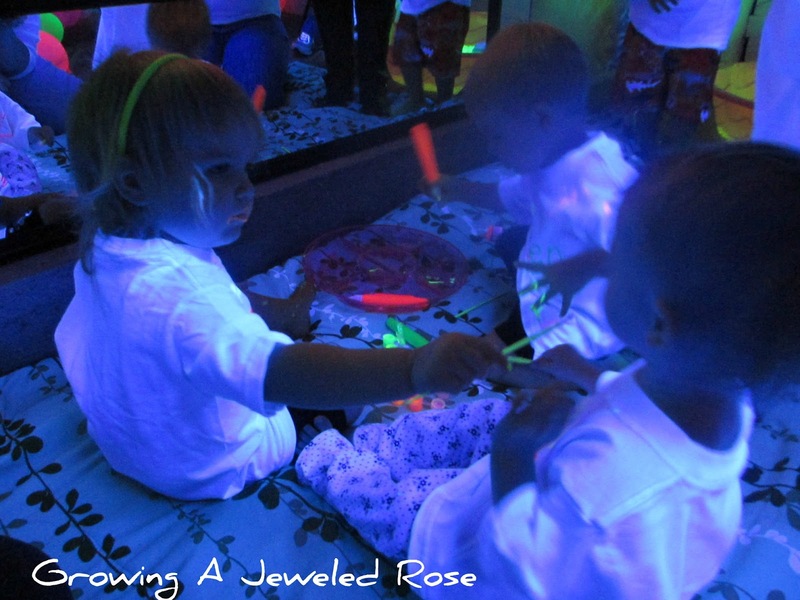 I look forward to sharing our discoveries with you in the future! I also just want to remind everyone that you do not need to fill a room with black light to have fun exploring with it. 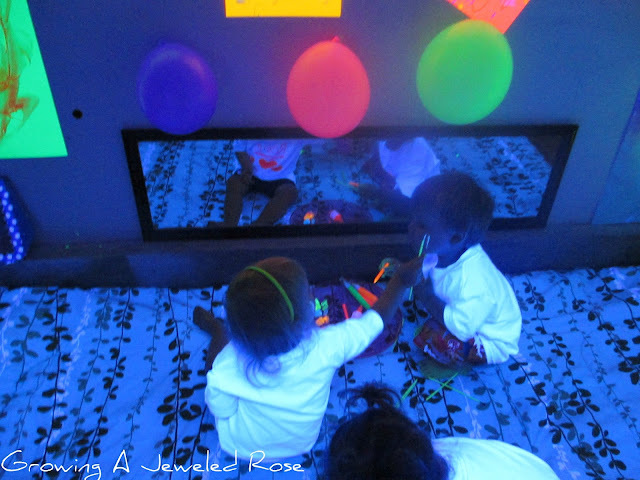 Prior to this play date, Rosie and Jewel were exploring with a single black light fixture, and it was more than enough to light a small room. 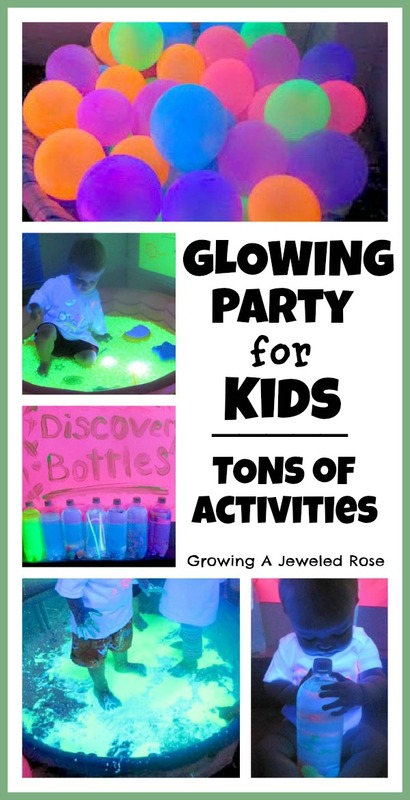 Also check out our glowing play collection for lots more fun!